Every wonder what it is about romantic suspense that keeps us on the edge of our seats? For me it’s trying to figure out just what the villain is going to do next to the hero and heroine. Villains make the hero and heroine stronger for what they have to go through to get to their happily ever after. I’ve recently read two very good suspense novels that tackled the villain in very different ways. In The Past Came Hunting by Donnell Bell, the villain is known from the beginning of the story. He tracks down the heroine and the reader knows exactly who he is and even some of his motives. What the reader doesn’t know is if, when and how he’ll catch up to her. In Elizabeth Naughton’s runaway hit Wait for Me the reader has no idea who the villain is, let alone the whens, hows and whys. I enjoy both of these approaches, and I’ve implemented them both. 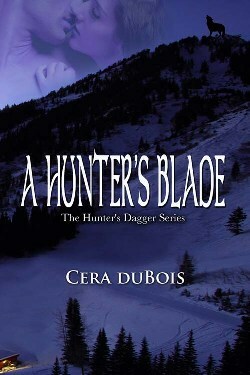 In my recently released second paranormal A Hunter’s Blade by Cera duBois, the villain is completely unknown. The hero, who is a vampire but also a hunter, comes to a tiny Colorado town to destroy the werewolf living among the humans after several humans are killed by “animal” attack. I loved writing this story and the freedom playing in the paranormal allowed me. The entire time the reader is given clues as to whom the real murderer is, as well as some bogus red herrings. Is the killer the female werewolf who the vampire hero is falling for, or is it the older vampire in town? The real villain along with his motives are not revealed until the climax. In Gambling On A Secret by Sara Walter Ellwood, my debut contemporary western, the villain is my tribute to one of my favorite villains of all time—JR Ewing of the TV show Dallas fame. The readers know him from the beginning as the oilman temps the heroine at every turn, while the hero insists on knowing what he really wants, but the villain’s motives are kept secret until the end. I approach this type of villain again in my upcoming contemporary western romance release Heartstrings. In this story, the villain is the heroine’s ex-husband and the county sheriff. He’s blackmailing the heroine to keep secret her daughter’s paternity in order to protect a deeper, darker secret. Although this story isn’t technically a suspense plot, my villain was created in the same way as the ones in my true romantic suspense novels. All villains have to have the same character development as the main protagonists. Whether the reader knows the villain from the beginning or he/she hidden and unknown to the reader until the very end, the author has to understand his/her goals, motivations and conflicts just as the writer has to know those of the hero and heroine. When this character development isn’t complete, the villain turns out cartoonish and not very believable. What kind of villain do you prefer? One that you know from the beginning, or the one that surprises you at the end? Brigit Wolfe, a born werewolf, hasn’t killed a human in over a hundred years, although now, she wonders if the animal attacking people in Silver Creek, Colorado, isn’t her. But she might have bigger problems when her cowboy neighbor, Austin Calhoun, ambles into her bar. Austin hasn’t been a vampire for long, but he is determined to prove to himself that he’s worthy of his hunter’s dagger. Brigit’s rare beauty and blade-sharp tongue enchants him. She ignites a passion he thought was dead, but is she the killer his master sent him to destroy? During Austin’s investigation regarding Brigit’s involvement in the deaths, an old crime surfaces connected to her human best friend. These two immortal enemies have to join forces to solve the mystery before someone else dies. But can they survive the heat of their own desire? “I don’t hurt my prey,” he said through clenched teeth. He’d never let her know battling the beast within every feeding was the hardest thing he’d ever done. “If you didn’t kill those people then you have nothing to worry about. Best way to figure out who did is by working together.” He put the sliver blade away, and his fangs retracted. Dylan has his demons, too. The former Special Forces commander can’t get past his ex-wife’s betrayal and the botched mission that left him with much more than a bad limp. Certain the greedy oilman next door to Charli wants much more than just her heart, Dylan’s even willing to stop drinking in order to protect her. Carolyn Brown, New York Times bestselling author of Just a Cowboy and His Baby. 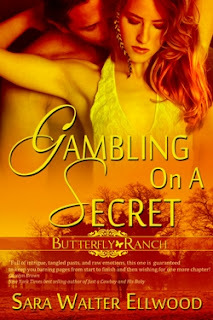 Ms. Brown also named Gambling On A Secret as one of her favorite romance reads in 2012 in the Happy Ever After Blog on USA Today. “Ferguson, what are you doing here?” Dylan barked. She lost the battle with the urge to wrap her arms around herself. As much as she appreciated Leon’s kindness, respected him, and was even a little attracted to him, something about him didn’t sit right with her. He represented her peers in the community. According to Mrs. Pratt, besides the Cartwrights, she and Leon were undoubtedly the wealthiest residents in the county. No one in Colton could learn about her past. It would ruin her, and Leon, no doubt, had the means to dig up the dirt. Upon hearing the jibe, Leon’s shoulders jerked in mid-stride. Sara Walter Ellwood is an award winning author whose novel Gambling On A Secret was named by bestselling author Carolyn Brown in the Happy Ever After Blog on USA Today as one of her favorite romances of 2012. Although Sara has long ago left the farm for the glamour of the big town, she draws on her experiences growing up on a small hobby farm in West Central Pennsylvania to write her stories. She’s been married to her college sweetheart for nearly 20 years, and they have two teenagers and one very spoiled rescue cat named Penny. She longs to visit the places she writes about and jokes she’s a cowgirl at heart stuck in Pennsylvania suburbia. She also writes paranormal romantic suspense under the pen name of Cera duBois. Love this post, Sara! I especially love, love, love what you said about the author KNOWING their villians. As an editor, I harp on this all the time. Antagonist character development is every bit as important as everyone else in the story! Well done and I love the design and layout of this blog. Gotcha followed. Whoot! fun post, Sara...I like all villains - the known and the unknown. For me, its the development of the villain, how the Hero and Heroine react to the new details and how that pushed the tension in the book. Thanks for posting! Hi Sara. You have the best book covers. I haven't tried writing an unknown villain yet. The clues and red herrings sound like fun. Maybe the next one. I think I like both types. I enjoy reading a story where we get to know the villain and his/her motives from the beginning, but right now, I'm reading a Dean Koontz novel where the protagonist has no idea who the villain or villains are and it's his pursuit of the truth behind the strange happenings in his small town that drives the story. I think a villian should be as complex as the hero and heroine. You should give them as much attention to make them a full rounded character. True--because in the villain's eyes HE is the hero. He thinks he's perfectly right and justified. Good post! Villains are so important. And as a reader and writer, I love getting to know them. The villain cranks up the conflict, making the reader more invested in the hero and heroine winning and ending up together in the end. But be careful when writing villains. Make sure you make them three dimensional characters and not cookie cutter bad guys. Make the reader almost have sympathy for them. Makes for an exciting read. For me the villain has to have just as much of a character arc as the two main characters. He (or she) has to be fully developed and the reader needs to connect with him. Whether through hatred or sympathy. I especially love a villain I can be sympathetic to and say, "Yes, I can see why he would do that and if I were in his shoes, I might do the same." Great post. I like being surprised by who the villain is and I love your choice of using JR Ewing as the model for your villain in Gambling on a Secret--he's my all0time favorite villain because he may be mean, but you can appreicate the sincerity of his motives. Sue Sylvster in Glee is another example of a villain who is doing all the wrong things for the right reason. Great post, Sara, thanks heaps. Am currently developing a villain at the mo, so great timing too! Nice post. No preference with villains. Thanks for the great post! You're absolutely right that the villain makes or breaks a romantic suspense for me. You have to have the right balance between the good and bad and if it's not there the suspense falls flat for me. I like a good mix of the known and unknown. Thank you, everyone, for stopping by! I'm glad to see such a mix in preferences. Loved the blog. I like both types of villains. I my books I have both the known and unknown villian. Sometimes they know him but don't know he's the villain yet. Oooh, I love a good villain! I love it when the villain's been under my nose all along, where the author has been giving the reader little hints all along who the villain is, and then BAM he catches me by surprise. I love to write 'em that way as well. Great post, Sara! To answer your question, It doesn't matter to me whether I know the villain's identity or not. For me, it's all about what the villain will do next, and when he/she will catch up to the H/h. I once got so into the head of the villian, that he became too human and I let him reform and steal the heroine from the hero. That really confuses the reader, so I try to keep a bit of distance now and not get caught up in the past that turned him bad. That's where the danger lies, because one I know what caused him to go bad, I want to fix it. Another great post, thanks Sara. I like both types of villains, I'm not sure I have a fave. I like being in on it at the start, but also like being surprised. You've made me think now...! Thanks! I must be the only person I know who doesn't like villains. They crop up in my books, but I don't like them at all. Tweeted. I totally enjoy all kinds of villains, Sara. But I think my favorite are the ones I don't know anything about. I don't do thrillers but secret villains can be in any plot and I like that.